When faced with a natural or man-made disaster, which cuts off basic necessities such as food, water, first aid and other essential needs, you need to have a means to provide for those who cannot provide for themselves, and rely upon you, until professional assistance arrives. Each 20 ft, Level I, KTS Disaster Preparedness Pod is equipped with enough basic rescue, emergency gear, and basic life sustaining supplies to support up to 200 people for several days. Each Kodiak Disaster Pod is carefully stocked with the basic items needed for short term survival with the option for additional supplies and equipment. There is enough room to add items that suit your particular needs. We have seen the destruction and devastation that have occurred in various parts of the country by massive floods, tornados, and earthquakes. Communities that have been isolated and had to provide for themselves until supplies could be airlifted in. Outfitted with basic human needs such as water, dry good foods, first aid, lights, blankets, tools, etc these may be personalized for specific populations or geographic locations. 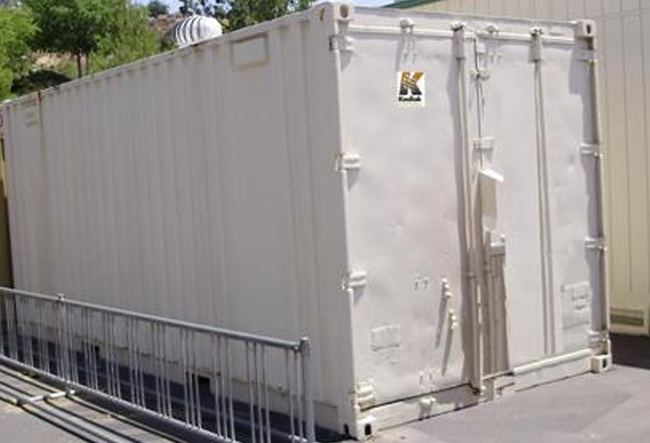 These fully equipped disaster preparedness pods are ideal for schools and other high occupancy bldgs. Be prepared for a tornando, hurricane, or other natural or manmade disaster before they strike.